When we speak of the Garrotxa, speak no doubt about one of the regions of Catalonia with greater natural beauty. In this sense, the Natural Park of the Garrotxa is one of the most important volcanic landscapes across Europe, where there are recorded 38 volcanoes. Torn between Low and High Garrotxa, with a different landscape in terms of where we are. • High Garrotxa: most rugged scenery than Low Garrotxa. Numerous valleys, between walls of rock. • Low Garrotxa: wide plains, which extend to the foot of the volcanoes that inhabit the region. On your sightseeing tour of the Garrotxa region, you can not miss the visits to its charming towns. Surrounded by nature, and many of them historic, tracing its origins to medieval and Romanesque in some cases. The life of these small towns, has its heart in the town square, and in the Garrotxa, how could it be otherwise this becomes palpable. Here are the main celebrations populations, and we also find some of the most valuable architectural elements. Discovering the main points, we can not lose each of the charming villages found in the Garrtoxa. ✓ Know the religious statues industry (XIX). Visit the Museum of Sant. ✓ You must taste "the volcanic cuisine". ✓ Know the oldest bullring in Catalonia. ✓ Visit the group of modernist buildings of the city. ✓ Visit the Museum of the Garrotxa. ✓ Essential buildings: the Cloister of Carmen, Hospice, Church of Sant Esteve, Tura Church and the Main Theatre. • Besalú: Beautiful medieval village. With a wall and a spectacular bridge over UppersCapellada and Fluvia rivers. One of the most important medieval towns throughout Catalonia. ✓ Visit the castle, its bridge and its walls. ✓ Enjoy a stroll through the historic streets. ✓ Visit the Jewish Synagogue and the Miqvé. ✓ Visit the noble house "Casa Cornellà". • Vall d'en Bass: located at the beginning of the influx of the river Fluvia. Wooded area. Composed of seven kernels of great beauty. ✓ Visit the medieval prison of Mallol. ✓ Be in the landscape of Sant Quintí d'en Bass. ✓ Walking through the beautiful street "carrer Teixeda" in Hostalets d'en Bass. ✓ Visit the Church of Sant Esteve d'en Bass. • Santa Pau: medieval Old Town, located inside the Natural Park of the Garrotxa. Declared "Old Historic Landmark." ✓ Visit the castle of Santa Pau. • Castell Follit de la Roca: village located on top of a basalt cliff, 50 meters high, which makes it look spectacular. It has less than 1km from surface. ✓ Admire its uniqueness before entering the village. ✓ Walking through its streets. In the Garrotxa we found a very special and personal landscape, from his altitude and high rainfall index. It is why it is, probably, the greenest landscape in Catalonia. In this tourist guide about Garrotxa, we could not overlook their natural heritage. The most important river of the district is the Fluvia (not too plentiful), but we can look at both sides as the vegetation grows. The landscape varies from north to south. North Areas and rougher terrains make that we find a rugged vegetation type. In the south the landscape is more gentle and relaxed, this is where we find the Natural Park of the Volcanic Area of the Garrotxa. The most valuable assets is the Natural Park of the Volcanic Area of the Garrotxa. We also found a huge beauty forests, where stands the "Fageda d'en Jordà"
One of the most important natural parks of Catalonia. Its uniqueness lies mainly in its volcanoes, one of the largest parks in Europe. Its volcanoes are mainly nestled at the end of the valley, or on the sides of the mountains. The volcanism in the area has been active for more than 700,000 years ago. Currently the slopes of the volcanoes are upholstered with green vegetation in the area offering a very special landscape. The two best known are the volcanoes of Croscat i the Santa Margarida. Croscat Volcano: it is the volcano of the area that most recently erupted, about 10,000 years ago. The Croscat is also the largest volcano and young throughout the Iberian Peninsula. Tours can be made in it. Santa Margarida volcano: spectacular volcano with a perfect shape of its crater (about 350m in diameter and 70 meters deep). Inside are the Romanesque chapel of Santa Margarida de la Cot. Fageda d'en Jorda: it is a beech wood, very unique, because of the low altitude on where it is and all the mystique that has surrounded him in Catalan culture. Artists have surrendered to its beauty. It is located on a slope of volcano Croscat. La Garrotxa is a region that offers to visitors a variety of activities. The natural environment will make us enjoy even more of these activities. In the following links you can see the different companies and sites that provide information on the activities that we perform. • Balloon Flights: overflying this Garrotxa and enjoy an aerial view of the volcanoes is possible by balloon flights offer. • Tourist Train: covers some of the main attractions of the region. It is a convenient way to travel and different Garrotxa. • Horseback and donkey riding: ride an animal through the region is an unforgettable experience. In the Garrotxa is possible. • By bike: cycling enthusiasts can stroll through the highways and byways. There are marked trails and bike routes that have made. Here you can discover. Just as companies you can rent a bicycle. • Hiking: long walks on paths surrounded by virgin nature, where car noise and stress points, sounds like distant echoes. There are marked trails created by hikers and other experts and enthusiasts. • The liquor Ratafia: made with nuts and brandy. • Plate of beans with sausage in Santa Pau. • Sausages Castellfullit of the Rock. • The yogurts that are made in the cooperative Fageda. 6. - Where to stay? 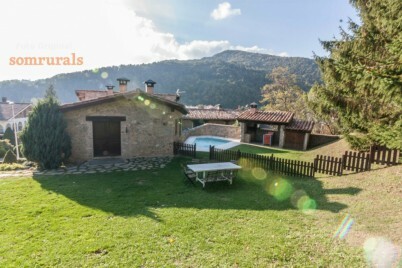 To spend pleasant days between the nature of the Garrotxa, we recommend you to take a look at our apartments in the Garrotxa, all surrounded by a spectacular natural setting. Find peace and tranquility among the valleys and mountains. Private pool. 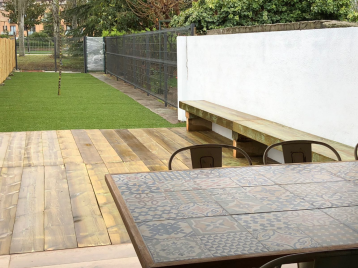 Garden with barbecue and chairs. Bright and quiet cottage. Rural house at the foot of Lake Banyoles, ideal to discover the nature of the environment. Perfect for groups of up to 8 people. 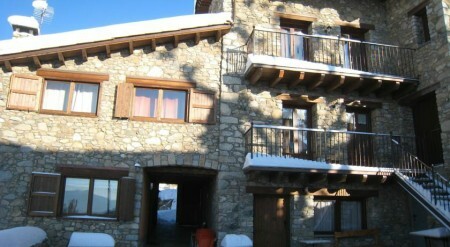 Cottage in the mountains of Cerdanya. Ideal to enjoy the scenery as a couple.